I may have mentioned this once or twice already but I am a total coffee fiend! I drink so much of it I could almost be considered an addict. I can’t even function in the morning until I have had my cup of hot back java. And it’s always a bonus if I can eat my coffee as well. 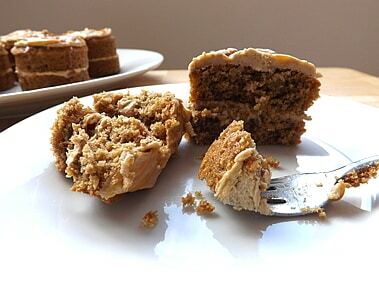 Hence why I set out to find a lovely coffee cake I would want to bake again and again. I have to admit also to being a bit of a coffee shop fan, much to my partners dislike. But I can’t get enough of Starbucks’ Caramel Macchiato and Triple Caramel Frappuccino or Costa’s Salted Caramel Latte and lets not forget Neros’ Caramelatte. 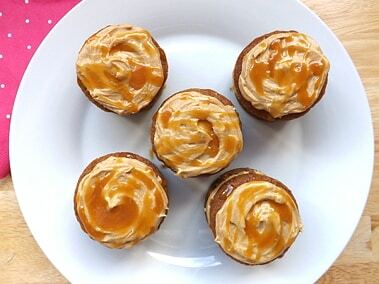 Seriously Coffee and Caramel… I’m in heaven. 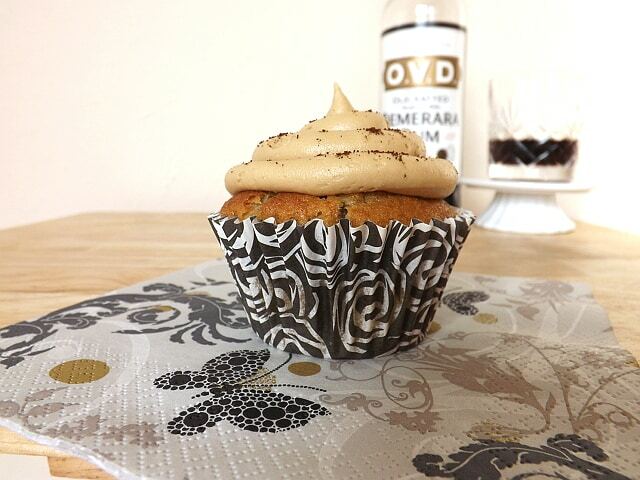 So I set out to make a cake version of this drink, I wanted Coffee Cake with a salted caramel sauce. 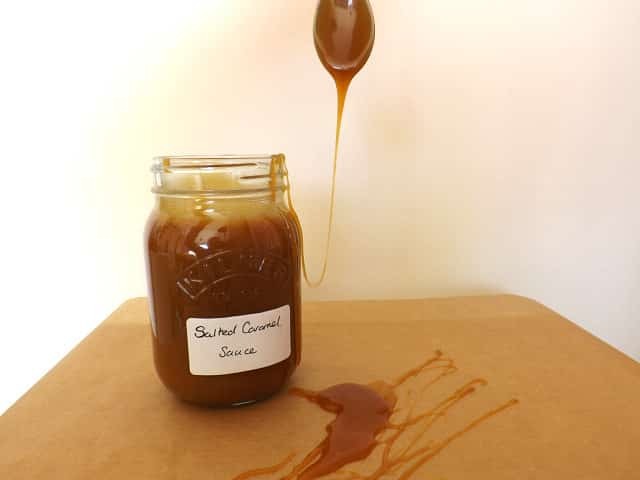 Hey it’s got to be salted caramel sauce, its fab and if you haven’t tried it yet, seriously what’s stopping you? You are in for a taste sensation. I decided to make little mini Victoria sponges, because I had a tin designed for them and they are so cute, but there is no need to rush out and buy a new tin. 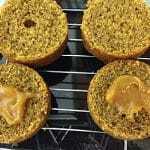 These will make lovely cupcakes and if you did want to make mini Victoria sponges, just bake your cake as a flat large sponge and use a sharp round pastry cutter and carefully cut out your rounds. 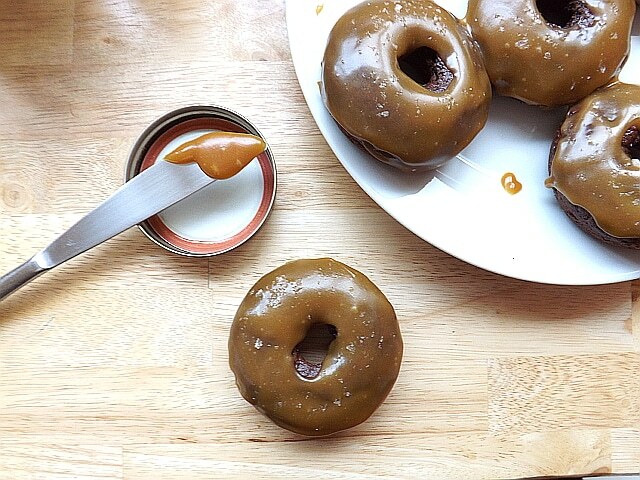 I used my (now fridge constant) homemade salted caramel sauce. If you have the time try giving it a go, the flavour is amazing. But if you don’t, you can buy caramel sauce at most major supermarkets now. 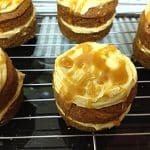 The caramel is not a must but it definitely adds a certain something to this cake and I would highly recommend keeping it in the recipe. 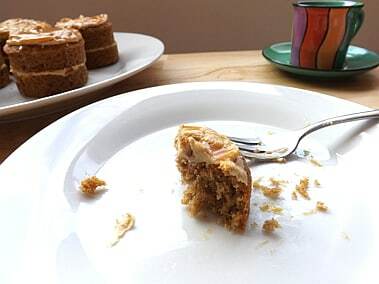 What I love about this cake is that the coffee flavour is not over powering it just perfect and another great thing about this cake is its just a case of chucking everything in a bowl and mixing. So it doesn’t create lots of washing up, and lets face it none of us really like doing dishes. 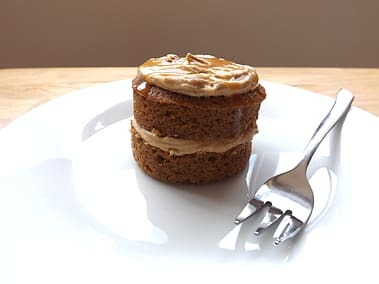 This is a lovely light sponge, not to different from your typical Victoria sponge, light and crumbly and the coffee buttercream helps bring it all together and the salted caramel drizzle just adds that little something extra. 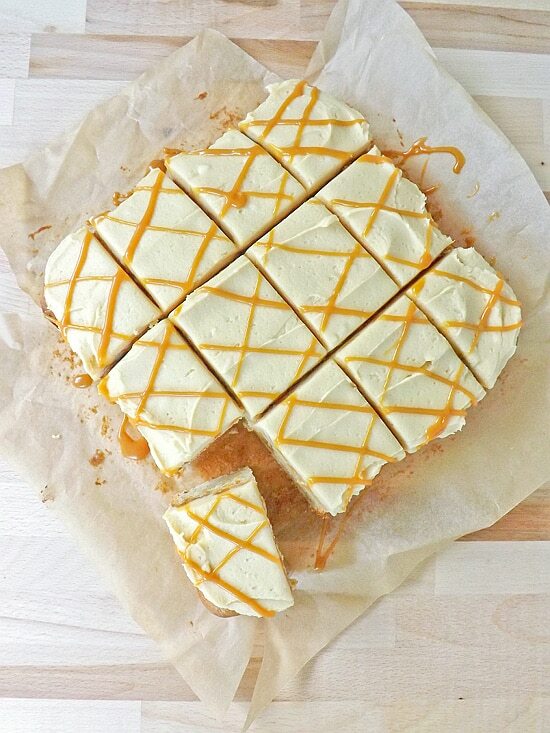 A moist coffee cake with a smooth coffee buttercream and a salted caramel drizzle. Preheat your oven to 180C / 350F / Gas mark 4 and prep your tins. 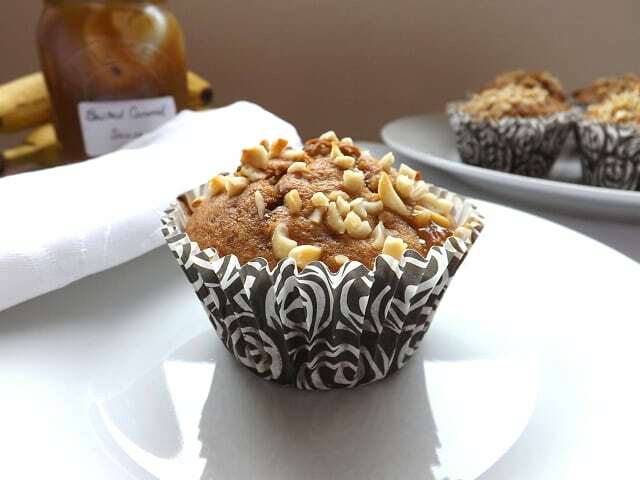 Either lightly grease if using tins, or pop liners into your muffin tins if making cupcakes. Blend your espresso powder with your boiling water in a shallow cup or bowl. Place aside. 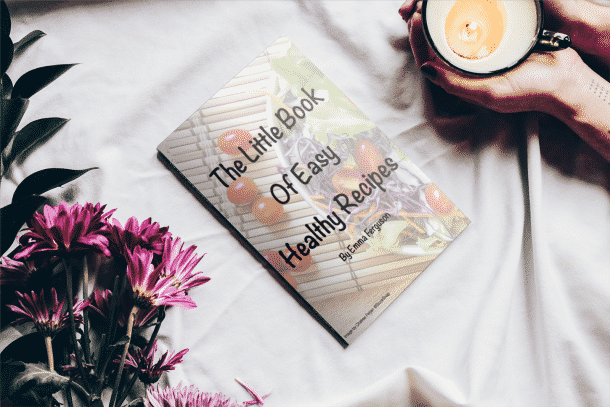 Put your butter, sugar, eggs, flour, baking powder and espresso mix in a large bowl and using a hand mixer or your stand mixer start on a low speed moving up to medium when it all starts to come together. Beat everything together until everything is well combined. 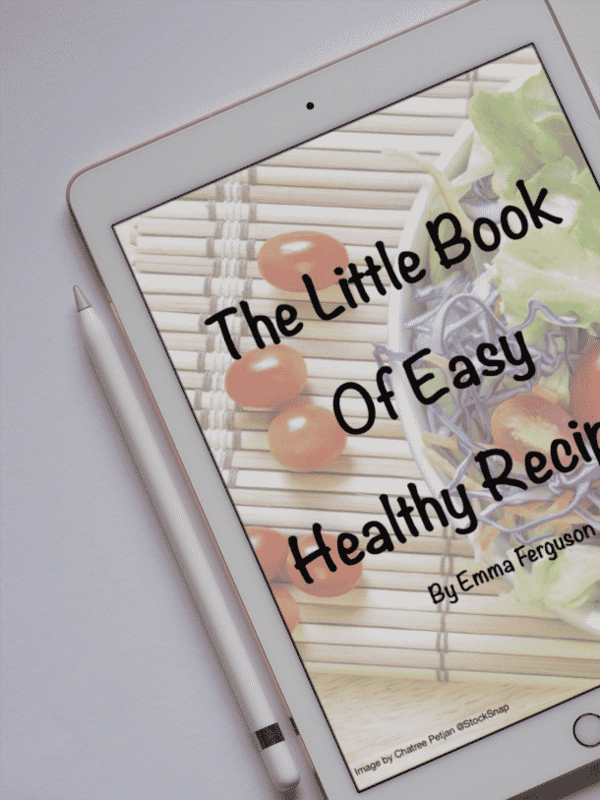 Divide equally between your muffin cases / mini Victoria sponge tins or pour it all into your large square tin and place in the middle of your oven for 20 minutes. Or until firm to the touch and a toothpick comes out clean. Leave them in there baking tin for 5 minutes to slightly cool down. Then transfer the cakes / cake to a wire rack to fully cool down. 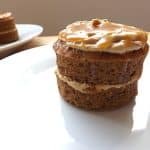 While the cakes are cooling on the wire rack, mix your espresso powder and boiling water in a small cup or shallow bowl, once mixed place aside for a minute. 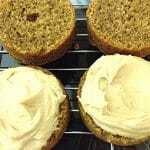 In a medium bowl with a hand mixer or using your stand mixer beat the butter until it is light and fluffy. Add the icing sugar and mix until it is well incorporated. Add the cooled coffee and beat everything until is smooth and creamy. 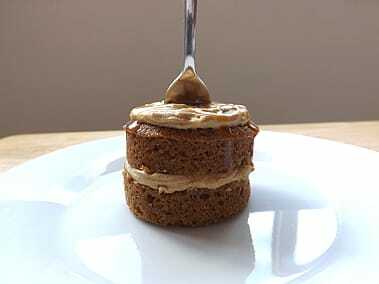 Add a dollop of salted caramel sauce to the centre of you mini cake. Add a spoonful of buttercream and sandwich the two halves together. 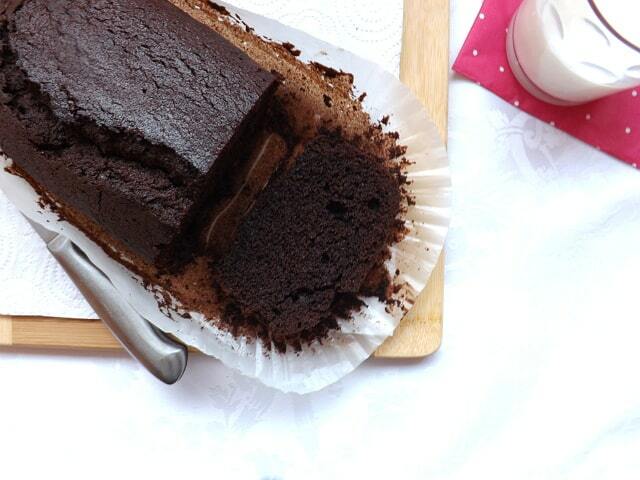 Add another generous spoonful of the buttercream to the top of your cake. 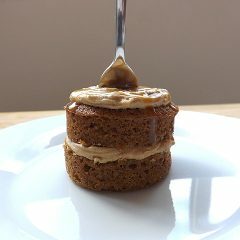 Drizzle more salted caramel sauce over the top of your cakes and allow it to drizzle down the sides, for a lovely homemade look. Serve and enjoy. These will last for 3 to 4 days in an airtight tin. 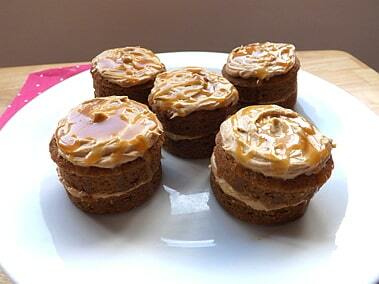 Yum yum, these look and sound amazing! It’s so good and so versatile as well. It’s definitely worth giving it a go. 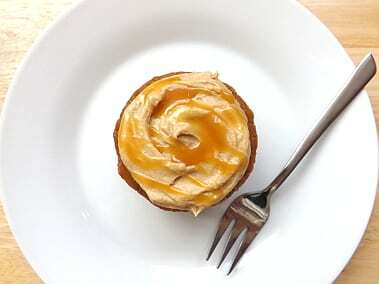 I got my first ever taste of salted caramel a few weeks ago and it was amazing. Hi Bintu, I can’t get enough of it. Since I first made it I always keep a jar in the fridge now, it’s so good and so versatile as well. It’s definitely worth giving it a go.